Uncover the hidden charms of the Greek island of Paros on this overnight experience from Athens, and enjoy a choice of tourist- or first-class hotel accommodation. One of the most popular Cyclades islands, Paros is sure to leave you enchanted with its quintessential white and blue houses, cobbled streets, turquoise waters and ancient ruins. The experience is unescorted, giving you the freedom and flexibility to set your own agenda. Board your air-conditioned coach from outside your centrally located Athens hotel, and enjoy a scenic journey to a nearby port. Here, embark on your ferry ride to the beautiful port of Paros. Sit back and relax in comfort, taking in stunning views of the Aegean Sea as you cruise along. Arriving in the late morning, travel by air-conditioned coach to your Paros hotel. After checking in, the day is yours to spend at your leisure. The second largest of the Cyclades islands, Paros has a little bit of everything: gorgeous sandy beaches, whitewashed villages, blue-domed churches and fishing harbors, filled with tavern tables and lively bars. Perhaps spend the afternoon in Parikia, the islands capital. Have your camera ready as you stroll along the villages cobbled paths, passing by old churches, shops and traditional white and blue houses. Take in breathtaking panoramic views from the 13th-century Venetian castle that is situated on a hill in the center of the village. Maybe also visit the 6th-century church of Panagia Ekatontapiliani, a place of worship that translates as the church with 100 gates  one of which is hidden! Enjoy a delicious breakfast at your hotel before spending the day independently exploring the island. 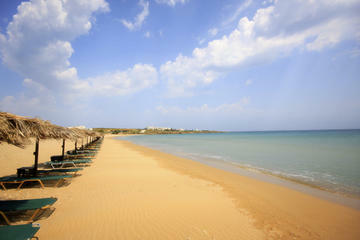 Soak up the sun at one of the many beaches or wander around one of the beautiful traditional villages such as Naoussa. The colorful fishing village of Naoussa is home to the ruins of an ancient Venetian fortress. For that postcard-picture perfect holiday snap, head to Lefkes. Located in the mountains at the highest point of Paros, Lefkes is surrounded by lush greenery and offers stunning vistas of the entire island. After your morning discovering the island, head back to your hotel in time for your coach transfer to the port. Hop aboard your ferry and relax on the journey back to Athens. Your overnight experience then concludes back at your centrally located Athens hotel in the early evening.